Summary: This resource from NWP’s College, Career, and Community Writers Program (C3WP) features two strategies that teachers can use to assess students’ source-based arguments. The “Using Sources Tool” focuses on the quality of students’ claims and how well they use evidence to support them. The “Claim, Evidence, Reasoning Protocol” can help students and teachers see how well they have developed source-based arguments. This page also includes student writing that has been annotated through the lens of the “Using Sources Tool” to illustrate how teachers can use the tool in their classrooms. These assessment strategies can be useful for teachers in any content area who are looking for effective ways to analyze students’ evidence-based arguments. Teacher study groups can examine and apply these two tools and discuss their impact. Teachers IDENTIFY and DEVELOP instructional next steps. 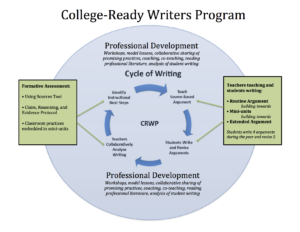 C3WP’s formative assessment tools are designed to provide a common lens and language to describe what students can already do and identify next areas of focus for their writing. In order to focus on some practices, while blocking out others, each C3WP tool focuses on particular dimensions of source-based argument writing. The tools featured on this page were created to be used collaboratively by teachers as they plan for writing Instruction.